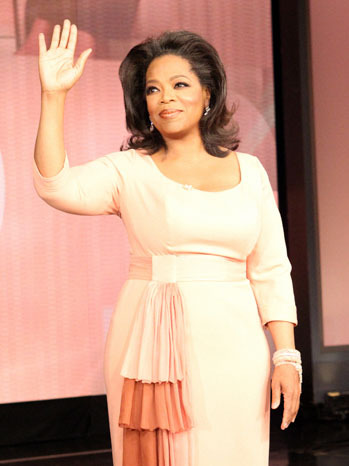 After twenty five years, 3,700 episodes aired in 145 countries, the daytime phenomenon that is The Oprah Winfrey Show has drawn the curtains, turned down the lights, and pulled the plug. The last show's ad spots went for a SuperBowl matching rate of $1 million dollars per 30 seconds, and no, I was not tuned in yesterday to watch the tearful goodbye. I read about it in TVWeek. I was not an Oprah Winfrey Show devotee. I'm sure Oprah is a nice person who can do major things for your career and all, but besides the fact that I'm usually cooking supper at four o'clock in the afternoon when her show has been on, I've generally only tuned in on occasion to see what interesting guest her starpower has drawn in. It was a stroke of luck then, that had me turning on the TV just in time to catch the infamous couch-jumping interview with Tom Cruise. I also saw a terribly embarrassing interview a few years ago with Hugh Grant, Colin Firth, and Renee Zellweger who were cruising the talk show circuit to promote one of the Bridget Jones's Diary movies. Oprah made the fatal mistake of attempting a game with Hugh wherein she played a slideshow of female actors he had worked with and asked him for the first word that came to mind. I think she was expecting a series of gushing, Hollywood style reactions to the slides, but that is not at all what she got. When Julia Roberts appeared on the screen, Hugh said something like "freak". When Sandra Bullock appeared, I believe "utter nutcase" was the reaction. Oprah was visibly put off, but Renee appeared to back her boys and never gave in to the usual 'I'll pat your back, you pat mine' mode of celebrity exchange that has made Oprah one of the most smug looking talk-show hosts I have ever seen. I also don't think Oprah realized that 'freak' and 'utter nutcase' are good natured compliments shared between chums in the U.K. (and parts of Canada). Colin Firth looked rigid and uncomfortable throughout, and rarely have four people been happier to part ways. It is interesting to look back on Oprah's influence on society, however. She certainly found a way to tap into the psyche of women (and I'm sure many men and teenage girls) all over the world. What else would keep her on the air for twenty five years, sell her magazine, and give her the idea of her worth as an entire network? Oprah figured out a way to tell millions of people what to read, what movies to see, what products to buy, what food to cook, what clothes to wear and how to wear them, what expert advice to listen to (namely physician Dr. Oz, psychiatrist Dr. Phil, finance guru Suze Ormon, celebrity chef Rachel Ray, who all have their own shows now), and even who to vote for for President. Her show covered it all. Oprah's own rags to riches story was interesting in itself and encompassed the elusive idea of the American Dream-come-true, which only made her more popular with viewers. So why am I not a fan? First of all, I already follow a religion (ba doom ching!) Seriously, though, I just find Oprah too bossy. You may remember that girl in school, the one who made it her business to come up to you in the hallway, toss her glossy, well groomed head and put on a confidential, condescending tone while she advised you to start wearing a bra or told you your hair looked better short. Oprah reminds me of that girl, and frankly, I'm beyond putting up with that now that I'm in my 40's. I was flipping channels recently and saw that poor tabloid-fodder Octomom sandwiched between annoying finance guru Suze Ormon and Oprah. Both women were going at her like the glossy haired bossy girls in the school hallway. "Do this, do that, don't do this, you need to do that...!" If I were Octomom, I would have told them to mind their own business, but then, she was probably paid a handsome sum to appear on the show - and that buys a lot of diapers. But really, is that type of interview journalism? No, and perhaps it's not meant to be. But then, what is it? I have often found talk-shows a bit odd. The best hosts seem to be comedians when the interviews are less interviews than opportunities for more comedy, or adversely, serious journalists asking intelligent questions people care to hear the answer to. Oprah's particular style of talk-show has morphed from its original focus on sensationalist topics (I believe she started out in journalism) to a format for do-gooders gone wild. Bossy do-gooders - even worse. Now they have a whole channel to themselves, the subscription only Oprah Winfrey Network, otherwise known as OWN. Will people pay extra for OWN, and if yes, for how long? Time will tell. They'd better invite some A-list celebrities and musical guests to leaven the mood or I have a feeling even the biggest fans will start to lose interest. Photo by George Burns and found here on the Hollywood Reporter website. Mothers are amazing creations. I know. I am one. That may seem conceited, but believe me, I am as amazed as anyone at how motherhood has changed me and helped form me into something almost unrecognizable to my former childless self. I was reminded of this fact on Monday, which was the nineteenth wedding anniversary of my husband and I. I was thinking back to myself as the young bride, of my preoccupations, my prejudices, my notions of how life and love should be, my ideas of how my future would pan out. I said my vows with conviction and opened our gifts with gusto. We would wait a year or two before we thought about children and space them responsibly. My husband would do exactly half of everything and our kids would never misbehave in the grocery store. By the fall I was pregnant. At my first visit to the doctor, I'm not sure what I expected - a reproof? - but my doctor said my pregnancy was great news. Women who had their first child under thirty had greatly reduced risks of breast cancer and birth defects, healthier pregnancies and easier births overall. What was that he said about 'healthier pregnancies?" I would think as I endured alternating waves of voracious hunger and horrible nausea most of the time. Looking back, I think it was all a preparation for motherhood. The birth of our first son went very well, was not too long, and little baby Ian took to feeding immediately. Caring for a tiny, needy, hungry infant seemed almost easy in comparison with the everpresent nausea and back pain of pregnancy, but what really surprised me was the incredible happiness I felt at suddenly finding myself a mother. My husband was a real hands-on kind of dad, even though at first, every time Ian cried my husband said, "I think he's hungry." Becoming a mother made my life make sense for some reason. To cement that point, we had another son fifteen months later and a daughter two and a half years after that. And another daughter five years after that. I took to motherhood like a fish to water, well, a fish that sometimes loses its temper and has occasional mini nervous breakdowns, but overall I was happy being 'Mommy'. Our family was a little world of our own where love reigned supreme and naps came a close second. Books and birthdays, bike rides and soccer practise, homeschooling first, then public school (and lessons in learning to accept each others differences) filled up the days, the years, and now, almost two decades. "Enjoy your children while they are little. They grow up too fast," said my Italian neighbour wistfully and often when we lived in Kimberly with the boys before their sisters were born. Her regular shouting matches with her grown up son when he visited could be heard all the way down the block. Now we have three teenagers and a nine year old who aspires to be one. I cook (a lot), I clean (when I have to), I volunteer at Sports Day and in the school library. I listen, I talk, I advise, I comfort. I assess health and energy level with a mere sweeping glance, and nip attitude in the bud. I laugh at their jokes and make my own (they even find them funny sometimes). I say 'yes' as often as possible and 'no' when necessary. I find a way for my son to attend the Arcade Fire concert after all hope seems lost, and I find a way to pay for braces and violin lessons, horseback riding and theatre camps. I tend to the sick and boost the work-weary. I stand up for my children and give teachers 'a call' if needed. I come up with ideas for limericks and proofread essays. I lead by example and raise hell when I have to. How do I do it? How does any mother do it? I wouldn't be a mother if I didn't take the occasional opportunity to show off my children. Our eldest recently performed at a youth festival in Vancouver. My daughter loaned me her camera and I took a video of the performance. The video quality isn't great, thanks to my lack of experience, but we posted it anyway. He's the one on guitar and vocals. While doing some driving around on Mother's Day afternoon, I was enjoying a radio program called The Vinyl Cafe on CBC. The Vinyl Cafe is a weekly variety hour hosted by Stuart McLean, who, as well as reading aloud letters from all over Canada, reads his own stories and welcomes a wide range of musical guests. It's an old fashioned concept which works very well on radio (think Garrison Keelor), and like so much of what the CBC does, serves to connect people from all corners of this vast country. This past Sunday, the theme of the stories was treeplanting, a job thousands of tough, young Canadians do to put themselves through school or to make their next adventure possible. Stuart first read out a wonderful letter written by a man from Winnipeg, whose adventurous 62 year old father-in-law spent a summer with a treeplanting crew, and while he wrote home despairing at his lack of treeplanting ability (it has got to be one of the toughest jobs out there) he proved to be a wonder at keeping up the spirits of the rest of the crew with his fireside stories and encouragement. After the letter, Stuart read one of his own stories about the fictional family of Dave and Morley and their two children, Stephanie and Sam. This week's tale was an uplifting and comical one about Stephanie's summer (and great success - a final daily tally of 2600 trees - after much perseverance) treeplanting in the blackfly-ridden bedrock of Northern Ontario.The story was so good and brought back so many memories that I sat parked outside the video store until it was over. The following post is an edited version of the fifth one I ever wrote. I'm posting it because it has a bit about my own experience with treeplanting, and also because, in our recent Federal election the Conservative Party won a majority government for the first time in years and there are rumours they want to do away with, or greatly cut back on funding for the CBC - something which concerns me greatly. Anyway, I hope you enjoy this reposting. "Believing I had supernatural powers I slammed into a brick wall." I think the song is about love but the line stands alone for me like a mantra. A few Facebook friends, one now in Toronto, one in Salt Lake City, one in Vancouver recognized the lyric and responded like the album really meant something to them too. I love when that happens - when a little community comes together for a moment over a joke or a shared passion for something. I guess that's the beauty of these social networking things. Anyway, last week, after I had found the album I put it on and started cooking dinner. (My kids, who had never heard the album, asked if it was some of my 80's music- and then scattered.) That line about slamming into a brick wall jumped out at me and I've been thinking about it ever since. Now I think I know why. When I was younger, a lot younger, I didn't exactly put bath towel capes over my shoulders and leap off the shed roof, but I did want, like many kids, to be, to do, so many things. In many ways I wished I had been born a boy, because I believed they had much more fun than girls. My closest sibling in age was a boy, two years older than me, and he and I played together most of the time. I always got along well with boys because I found them much less complicated than girls. When I was a skinny, undeveloped eleven and twelve year old I used to wear cut off jeans and baseball shirts and kept my fine hair short. I remember going into Woolworth's to use the bathroom, and when I asked for the key, the woman at the counter said, "Um...would that be for...um...the girl's bathroom?" She really wasn't sure. Not too long after that, when I was walking with my friend, Toni, who was extremely pretty, some boys called out, "Toni's got a boyfriend!" That was my first brick wall. I knew that even I could not be both a girl and a boy, and since I was getting to 'that age' I was pretty sure I preferred to be recognized as a girl. When my mom took me shopping for grade eight clothes I let her buy me a flowered blouse. Even so, my young life continued to include a series of attempts to be something I was not destined to be. Granted, I had many successes, but I would invariably take on too many extracurricular activities, and then crash hard when I could not handle my superhuman efforts. After my high school graduation I took a twenty-eight hour trip by train to visit my sisters in Winnipeg. Travelling alone was so unnerving that I stayed with my food basket in the one car the entire time, even though I knew one could move around most of the train - so I did what came easily. I introduced myself to the only person my age on the car and he and I stayed up almost all night talking quietly. During my third year of post-secondary education (I was still living at home with my parents) I decided that I should go to Europe. After all, everyone else was doing it, my friends were all well travelled, and it seemed like a rite of passage for college students. My sister Clare and her friend had recently come back from four months in New Zealand and Australia and I wanted to be able to do what she had done. I began saving money and looking around for someone to travel with. When none of my friends proved available, I began to think about going alone. The more I thought about it, however, the more I knew I couldn't do it. Every fibre of my being told me it was a bad idea; I just knew I did not have the confidence and worldliness necessary. The travelling given up I decided to try treeplanting - my brother was making loads of money at it, and I had university to save up for now. I was hired immediately by my brother's crew boss on recommendation alone. We rookies were to be bused in and out each day during a two week trial. The first day we left at 5:30 a.m. I had my new caulk boots and shovel, a plaid shirt and cargo pants, so I looked the part at least. We were given our heavy shoulder bags of pesticide soaked baby trees, given some instruction and a plot of slashburnt slope and told to go for it. I had never been one for hard labour and I wasn't sure how holding a treeplanting shovel in one hand and a baby tree in the other was going to change that, but I was willing to try. The girls around me were encouraging, but it seemed they already knew what they were doing, particulary one European girl who was built like a brick #$%*house. I planted tree after tree, about 500 by the end of the day. That doesn't sound bad for a beginner except for the fact that I planted at least a hundred on the wrong line and the European girl came to my rescue and helped me replant them. One day of the two week trial was all I managed in my very short career as a treeplanter. I came home after the first day with badly stretched achilles tendons, which had been shortened by being a dancer for several years, and could barely walk for a week. Oh, the humiliation of having to quit after one day! And yet another brick wall. A few days later, however, my mother's friend offered me a job working for her at the Kootenay Lake Summer School of the Arts as an administrative assistant. She had told my mom that if she had known I was going to try treeplanting, she would have talked me out of it. 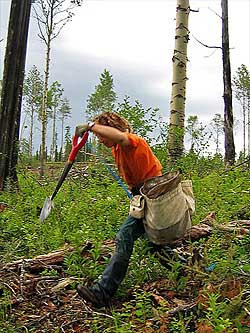 She had once owned a treeplanting company and knew it would not be the right kind of work for 'someone like me'. I was a bit choked when I heard that, but relieved about the arts admin. position, a job I loved and held for three summers, and a field I continue to feel at home in. Brick walls are, undoubtedly, hard to face up to and extremely humbling, but in the end, can prove to be our greatest friends. There is that old saying after all: "When a door is closed, somewhere a window opens," usually a window into our own natures and our limits, with a better view of the path we are meant to be on. My parents met in the late 1950's in Vancouver at the University of British Columbia, and even though they had left the city long before I was born, they maintained a strong connection to it and thought they may retire there one day. Both sets of grandparents lived near Vancouver and any holiday visits were spent exploring the beautiful city on Burrard Inlet. The Vancouver of my parents' day was very different from the Vancouver of today. Back then it was a big town full of bridges they talked about walking across late at night without reservation, a town full of culture and buzzing with activity, but with an expansive sense of space and community as well. I had a taste of that Vancouver on several occasions during my childhood, but even I, at the tender age of sixteen, sensed the city would never be same after Expo 86. At sixteen I had been invited to join TheatrePeace, an existing teen theatre group that was to travel to Vancouver on two occasions to perform a play written by the group of kids from the Kootenay area where I was from. Four of the original writer/performers had moved away and I was one of the newbies who was asked to fill their shoes. The play was a comedic take on the hot-button issues surrounding Ronald Reagan's 'Star Wars' policies of the Cold War era, and the question of peace in general. We held regular rehearsals up at the Student Union Building of the former David Thompson University campus in Nelson with two formidable women as our directors. In late spring of 1986 we travelled to the central Kootenays to audition to perform in the British Columbia Pavilion at Expo 86. We were accepted and a short time later we were off to spend a week performing our play for the world. I remember watching Prince Charles and Princess Diana, with a huge crowd of spectators looking on, open Expo 86 on television in May of that year and hearing about all the concerts and performers who would be on stage every night of Expo, Annie Lennox and Julian Lennon among them. The theme of Expo 86 was 'Transportation and Communication,' which frankly didn't capture my imagination at the time, although when I arrived at the site and spent my free time visiting pavillions with my theatre group friends, I became utterly fascinated by the imaginative installations by many of the countries represented; visitors to the Switzerland Pavilion, for example, were greeted by a 25-metre-high watch. 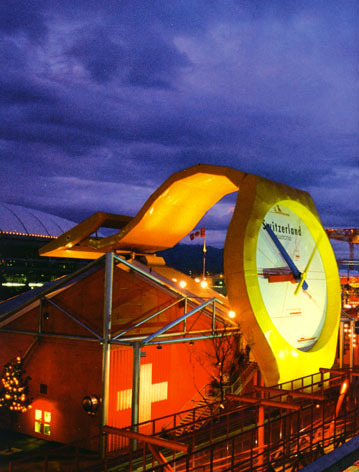 At that time, the Swiss made Swatch watch was the must-have accessory and I bought a bright blue one. Once inside, exhibits included a diorama of the longest tunnels in the world. Built in the 19th Century, Switzerland's Alpine railway opened a much needed route between northern and southern Europe. (The Swiss Pavillion also had a cool game to play called Jollyball). I was equally fascinated by the thousands of daily visitors to the exposition. I came from a small town and had never seen anything like the crowds of people lining up to visit the pavillions. May 2nd marked the 25th anniversary of the opening of Expo 86; I was reminded of the fact when my husband and I were dining last week at our favourite east Vancouver pizzaria, Lombardo's, and our waitress gave me a little questionnaire to fill out. Lombardo's is also making the most out of their own 25th anniversary by having a little contest: they asked customers what we were doing twenty five years ago. When I saw the question I immediately thought of my time spent at Expo. The Expo 86 site was a former industrial wasteland on the waterfront. It has since been home to the trendy False Creek neighbourhood and Concord Place. I remember busing around Vancouver with my friend and theatre mate Molly. It seemed that everything was under construction. The city had finished the first line of its light rail transit, SkyTrain in time for Expo. Condos were sprouting up everwhere and the roads were lined with brightly coloured temporary fencing guarding the construction zones. Molly and I were billeted at the home of some family friends of hers. We came and went as we pleased, taking the last bus home at 11 pm one night and receiving a scolding. Our host family may have worried about us, but we felt perfectly comfortable navigating our way through the city independantly. There were still hippies in the Kitsilano district then, occupying funky, run down Victorian houses, which are now all restored and selling for a million dollars each. Kids in studded leather jackets, Doc Martens boots and red mohawk hairdos still hung around the fountain downtown near the Hudson's Bay department Store back then, and though Molly and I were slightly less exoticly dressed, we felt at home and completely at liberty. Bill Bennett, who was British Columbia's premier at the time was quoted in a CBC.ca article yesterday. "We all grew together. Business got better, people were having fun, but they were also making more money." And according to Darcy Rezak, who was on the Vancouver Board of Trade during Expo, Expo also changed physical aspects of the city: "The SkyTrain, infrastructure, port facilities, the cruise ship business came hard on the heels of Expo," Rezak said. "So, a terrific transformation." I was there when it was happening, but Expo 86 was just another teenage adventure for me. In fact, I went on to write a rather scathing speech about the exposition for a French language competition because I had heard about the one thousand downtown eastside residents who had been made homeless by the new construction. Now, however, I look back and think the growth of Vancouver was bound to happen, and Expo 86, just like the Vancouver 2010 Olympics was a reason to build some needed infrastructure for the growing city. Although they still love the city where they met, my parents never did retire to Vancouver. 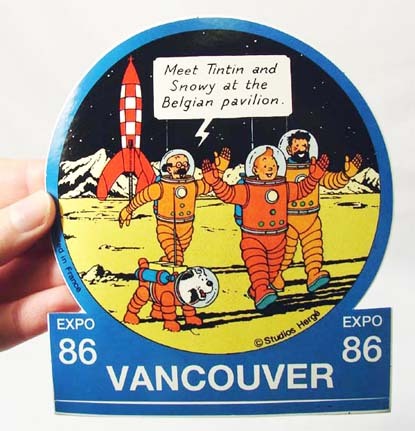 The top photo is of a Belgian bumper sticker from Expo, which I found online. I remember seeing that picture at Expo.